Earlier the same morning—May 12, 2017—that I spotted the siamese on Meade, a tiger-tabby leaped away as I approached on North Ave. He perched inside a fence in the yard next door to where The Colonel lives. Again I depended on the Leica Q and 28mm Summilux lens to capture enough detail to crop close in. Who says you need a telephoto? Gimme a great prime any day. 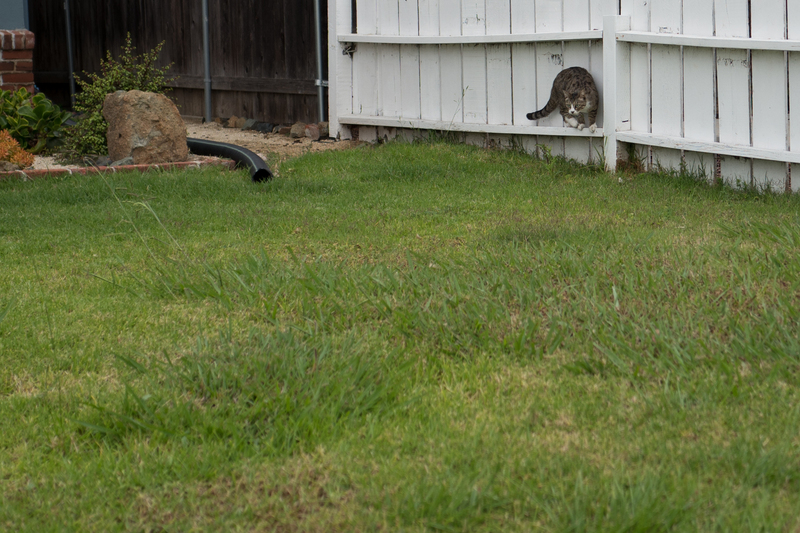 The Featured Image is the only capture of the cat before he skirted away. Vitals: f/1.8, ISO 100, 1/1000 sec, 28mm; 9:09 a.m. PDT. More kitties from the series: Scruffy, Roly Poly, Woo, Skull, Biscuit, The Colonel, White, Chipper, Frisky, Stretch, Needy, Farfisa, Mates, Hunter, Pee-Pee, Blue, Blue Too, Bonded Pair, Patience, Fess, Jumper, Frenemy, Looker, Cozy, Scout, Lurks, Skit, Mini, Betty, Black and White, Stalker, Bell, Chill, Sammy, Scratch, Poser, Star, Grey and White, Watcher, Herman, Comet, Roman, Willow, Chub, Nimbus, Watson, Lilo, Kit, Pepe, Twilight, Sebastian, Spot, Booger, Ash, Veruca, Riley, Mellow, Bonde, Flower, Glass, Black, BeBe, Fang, Bruce, and Siamese.